There are hundreds of hotels in Glasgow, I recommend you choose a central one so you can walk to all the Glasgow landmarks. In my opinion, Glasgow is home to some of the best street art in the world. As a matter of fact there are over 25 murals spread out throughout the city. For this reason, the Glasgow mural trail is not just one Glasgow landmark but several Glasgow landmarks. My favorite piece is St Mungo which is number 4 on the Glasgow Mural Trail. 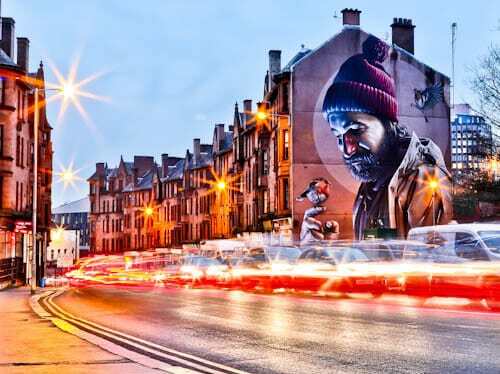 Additionally, due to the high quality of these murals they are also top Instagram spots in Glasgow. 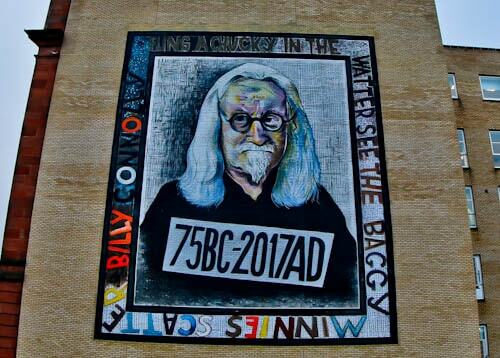 As part of the Glasgow mural trail you’ll come across 3 Sir Billy Connolly pieces. He is instantly recognisable to anyone from the UK with being such a famous and well respected comedian. However, if you’re not from the UK you’ll probably recognise him from the movies. He starred in several movies including Quartet, Gulliver’s Travels, Garfield 2, The Last Samurai as well as A Series of Unfortunate Events alongside Jim Carrey. 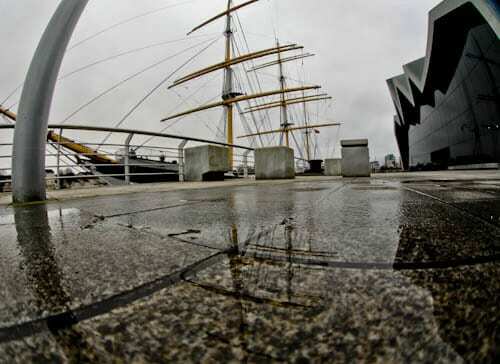 Firstly, the Riverside Museum as well as the Tall Ship are free to enter. The Riverside Museum shows the history of Glasgow transport throughout the years. With several interactive displays and also a historic cobbled street, you’re guaranteed a memorable experience. Adjacent to the museum on the Clyde River is the tall ship at riverside. Over the years, hundreds of ships were built at the Glasgow shipyards. However, only 5 Clyde built ships remain afloat today and only 1 remains in the UK. This is called the Glenlee and you can go onboard to explore the Victorian era ship. An interesting fact is this ship has sailed around the world 4 times and successfully passed Cape Horn 15 times. Read more about this ship and the Victorian themed events they hold on the Tall Ship at Riverside website. Up until the 1970’s, the Old Fruitmarket was indeed a marketplace. However, since then it has become a concert hall with a capacity of 1000-2000 people. What is unique about this concert hall is that it still proudly shows the shop names of its former vendors. Another interesting feature is the high vaulted ceiling. I visited the Old Fruitmarket as part of the Celtic Connections 2019. The performance I watched was Bassekou Kouyate & Ngoni Ba which is a group from Mali, Africa. 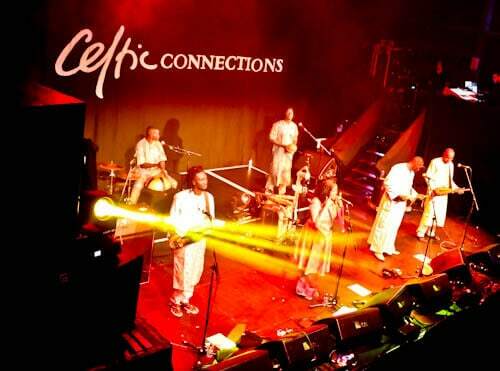 Celtic Connections is the largest winter music festival of its kind in the UK. 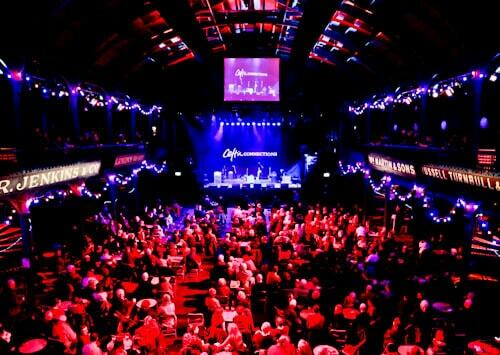 Over 2000 artists perform over 300 events at 20 venues throughout Glasgow. To view images from these events I recommend you visit the Celtic Connections Instagram page. The grand hall of Glasgow City Halls first opened in 1841 and was the first concert hall of its kind in Glasgow. As an example of its rich history, Charles Dickens has been here. Today it’s the home of the BBC Scottish Symphony Orchestra. For this reason, they regularly rehearse, record their music as well as perform here. 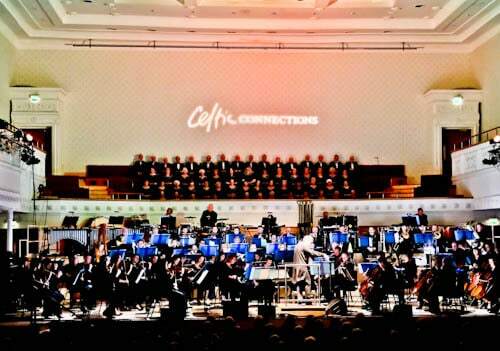 I visited the City Halls as part of the Celtic Connections 2019. As a result, I was able to enjoy the BBC Scottish Symphony Orchestra. 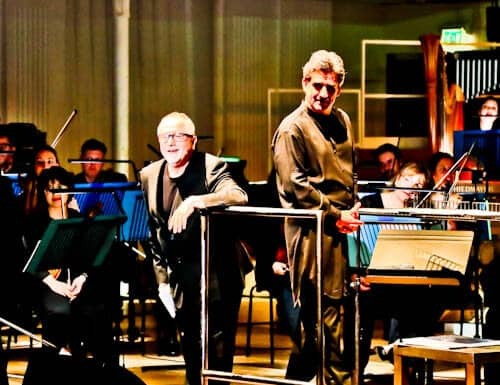 Famous Scotsman Patrick Doyle was performing the evening I visited. He has composed music for several popular movies including Harry Potter and the Goblet of Fire, Rise of the Planet of the Apes, Thor as well as Brave. 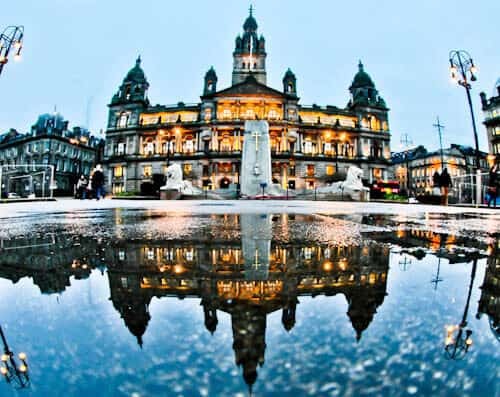 Glasgow City Chambers is home to the Glasgow city council. The architecture style is of 19th century Victorian. As a matter of fact it was inaugurated by Queen Victoria herself. You’re welcome to enter the building but you can only explore the interior as part of a guided tour. The tours are free and leave most days at 10.30 am or 2.30 pm. Finally, I strongly recommend you take this tour as you’ll discover one of Glasgow’s top Instagram spots. 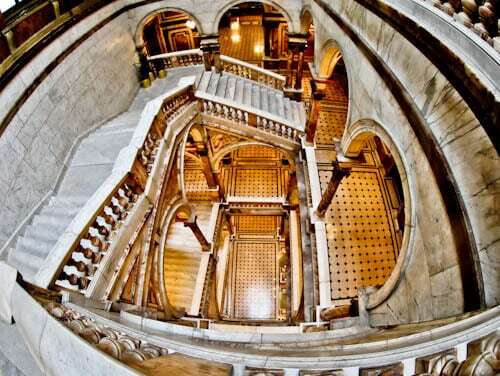 A top Glasgow Instagram spot inside the City Chambers in the largest marble staircase in Western Europe. I can picture girls posing as they walk up the staircase for that perfect Instagram shot. What’s more, as you can only visit it as part of a tour, you will have the staircase to yourself. For example, when the tour guide is telling the group about a painting or marble patterns, it’s highly likely to be empty. The history of The Lighthouse dates back to the 19th century. It was designed by Charles Rennie Mackintosh. 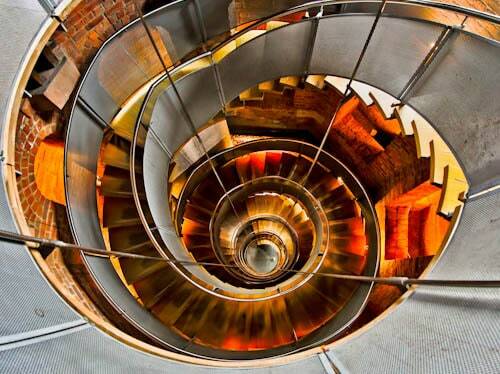 Climb the spiral staircase to the top of the Mackintosh Tower for panoramic views over Glasgow. Although the city views are stunning, it’s the picture perfect spiral staircase which is a top Glasgow Instagram spot. The Gallery of Modern Art is a Neoclassical style building. It’s history dates back to the 18th century. Throughout the years, it has been a townhouse, a bank, the Royal Exchange as well as a library. Finally, entry to the art museum is free. In front of the Gallery of Modern Art is the Duke of Wellington statue. It’s not uncommon to walk through big cities without paying attention to these large statues. However, the Duke of Wellington statue will grab your attention. He almost always has a traffic cone on his head, but why? The people of Glasgow would keep putting one there, despite the authorities taking it down. It became a cultural practise in Glasgow and I believe the authorities simply leave the cone there now. Furthermore, during the Olympics or an important football match, it’s not uncommon for the cone to be replaced with a themed version. 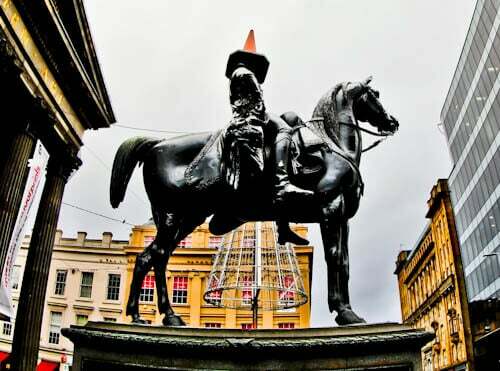 As a result of this traffic cone phenomenon, the Duke of Wellington statue is one of the most famous Glasgow landmarks. Buchanan street is a major shopping street in Glasgow. As well as several shops, you’ll find the Glasgow Royal Concert Hall. 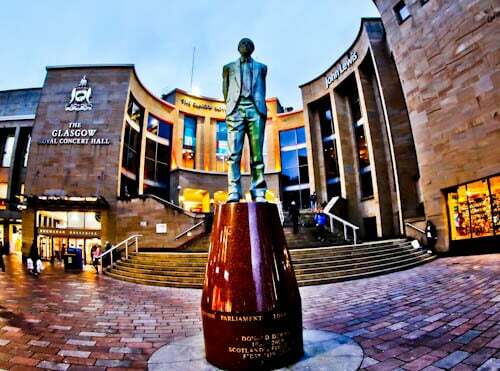 In front of the concert hall is a statue of Donald Dewar, the first leader of the Scottish government. Lastly, you can also access the Glasgow metro at Buchanan street station. 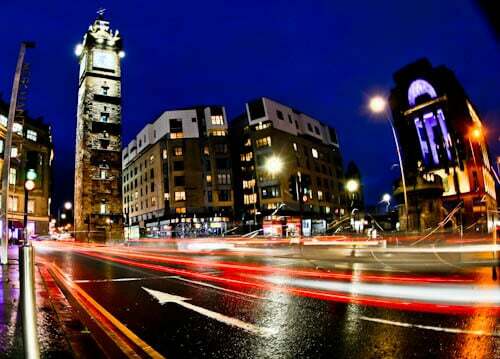 Another one of the Glasgow landmarks which grabs your attention is Tolbooth Steeple. 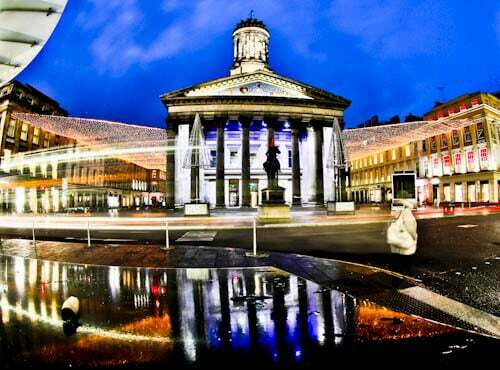 This is located in the oldest part of Glasgow known as Glasgow Cross. 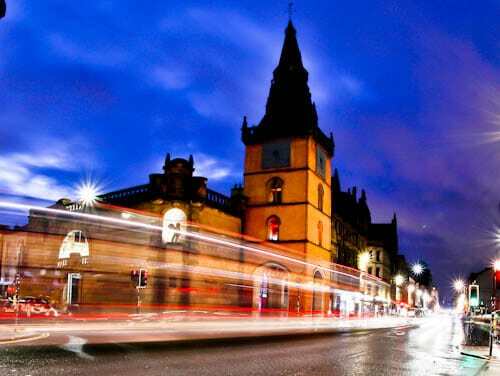 In fact, Tolbooth Steeple is one of the oldest buildings in the city. Tron Steeple is a short walk west from Glasgow Cross. It’s located on Trongate and is one of the oldest buildings in the city. Glasgow Necropolis is a Victorian cemetery. Over 50,000 people have been buried here so you can imagine how big it is. 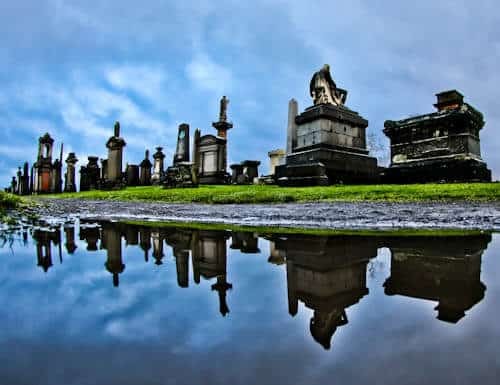 As you explore the necropolis you can also witness panoramic views over Glasgow. 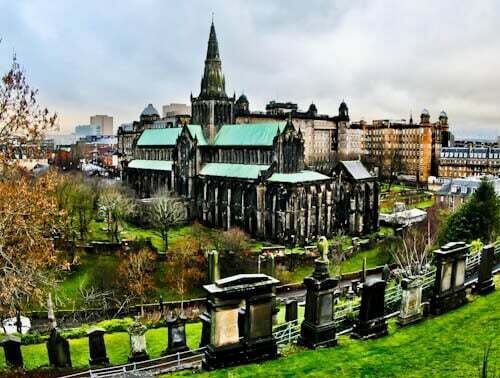 In addition, the best views of Glasgow Cathedral are from the Necropolis. Glasgow Cathedral is the oldest building in both Glasgow as well as mainland Scotland. It’s adjacent to the elevated Glasgow Necropolis. As a result the best views of the cathedral are from there. Lastly, you’re welcome to enter the cathedral and explore the historic interior. Glasgow Metropolitan Cathedral is also known as St Andrew’s Cathedral. 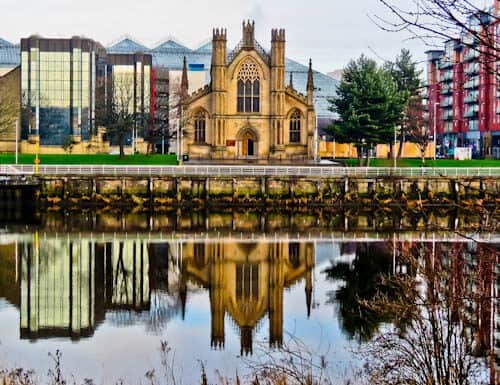 It’s located on the banks of the River Clyde. Glasgow Cathedral may be the most famous cathedral of Glasgow but this one is the most photogenic. On a day when the River Clyde is calm, the Metropolitan Cathedral photographs wonderfully. 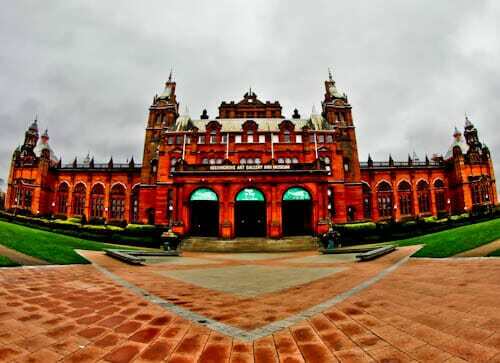 Kelvingrove Art Gallery and Museum is one of the most popular museums in both Glasgow and Scotland. The art gallery features paintings by some of Europe’s top artists. A popular piece is ‘Christ of Saint John of the Cross’ by Salvador Dali. There are further notable pieces by Rembrandt as well as Van Gogh. Finally, there’s a similar building opposite this one called Kelvin Hall. The Cloisters is part of Glasgow University. However, tourists are permitted to enter and take photos. The structure of Cloisters reminded me of the Instagram worthy Vakil Mosque in Iran. Nonetheless, you don’t have to go all the way to Iran to take the perfect Instagram picture! Lastly, parts of Glasgow university are spread out throughout the city therefore here is the exact location. 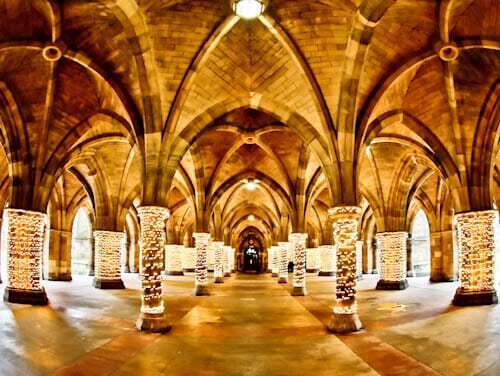 It’s not too far from Kelvingrove Art Gallery and Museum so you can easily add the Cloisters to your museum itinerary. 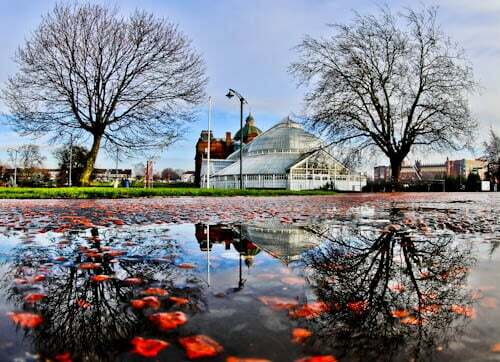 Glasgow Green is the oldest park in Glasgow and features many Glasgow landmarks within it. In the park you’ll find, Nelson’s Column, McLennan Arch, St. Andrew’s Suspension Bridge as well as the People’s Palace. The People’s Palace is a museum which gives a glimpse into Glasgow life through historic photos and film. Connected to the palace are the winter gardens. Entry to both the People’s Palace and Winter Gardens is free. The Glasgow Science Centre is a modern building located on the banks of the River Clyde. It was opened by Queen Elizabeth II in 2001. The interior features several interactive exhibits which will teach both you and your kids about science. On a beautiful day, the building itself is an Instagram spot and part of the rear resembles Cloud Gate in Chicago. Adjacent to the Science Center is the Glasgow Tower. 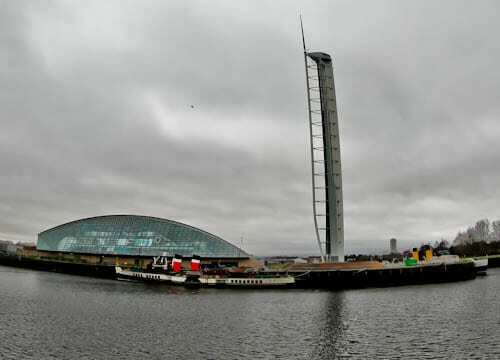 An interesting fact about the Glasgow Tower is that it’s the tallest, fully rotating, free standing structure in the world. Furthermore, it’s the tallest tower in Scotland. One of the famous London landmarks is of course the BBC Broadcasting House. Along the banks of the River Clyde is the Glasgow equivalent. 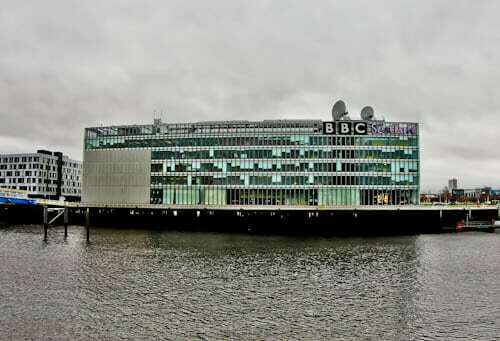 It’s known as BBC Pacific Quay and it’s the headquarters of BBC Scotland. 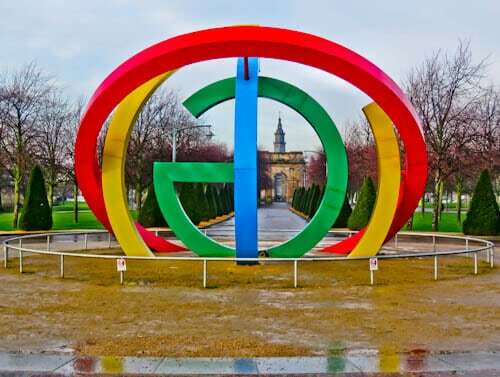 The River Clyde promenade walk offers you the opportunity to view several of the Glasgow landmarks. As a matter of fact, a few of the bridges which cross the river are Glasgow landmarks in their own right. The most famous bridge is the Clyde Arc bridge. 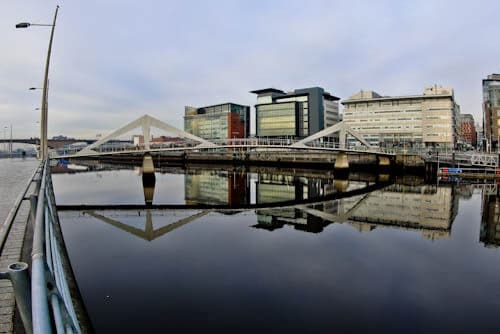 If you’re lucky and the River Clyde is calm, you can make some wonderful reflection photographs. Add to this to a colorful sunset and the River Clyde becomes a top Glasgow Instagram spot. You’ve probably heard of the movie, The King’s Speech. Did you know this famous speech was made at Ibrox Stadium? Furthermore, Sir Winston Churchill also made a famous speech here. 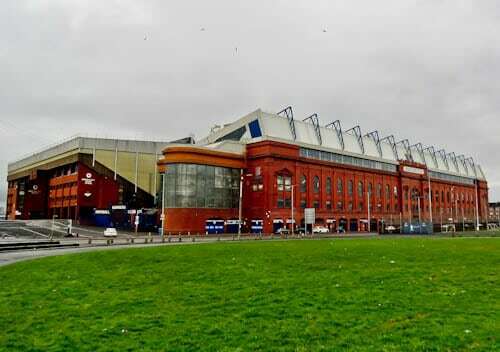 Of course, the stadium is famous for its football and top Scottish team Rangers but the history here is also very interesting. The main stand dates back to 1928 and on a visit you’ll learn not only about the famous football teams who have visited but also about the royalty and prime ministers. Lastly, read about the Rangers Stadium Tour on my UK Travel Blog. 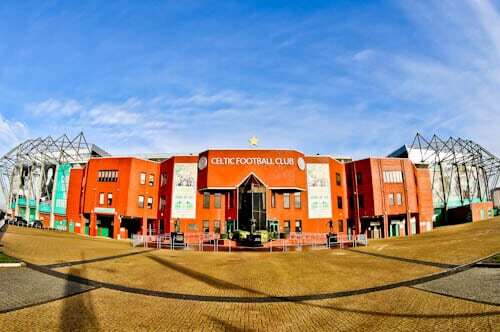 Celtic Park is the home of course to Celtic FC. Arguably the most successful club in Scotland, a visit to their stadium is a must. 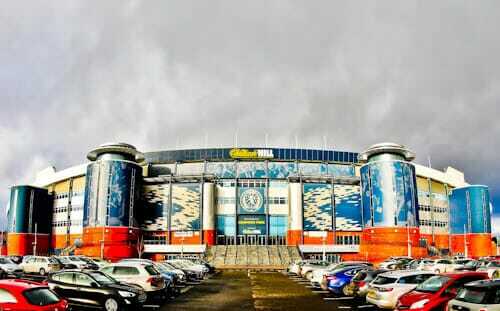 Furthermore, it’s the largest football stadium in Scotland. Did you know that Celtic were the first British side to win the European Cup when they beat Inter Milan in 1967? Read about the Celtic Stadium Tour on my Travel Blog. 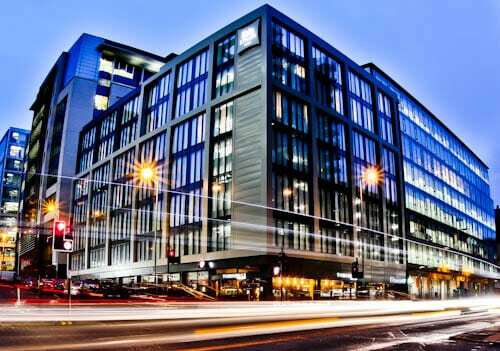 Ibis Styles Glasgow Centre West is a hotel so why is it one of the Glasgow Landmarks? Firstly, there’s a Duke of Wellington inspired mural at the entrance. Secondly, the lobby is full of Glasgow music themed memorabilia and Glasgow is of course the Scottish capital of music! Finally, they have 24 hour complimentary tea / coffee and snacks which every tourist loves! Read about my stay at Ibis Styles Glasgow West, more importantly, view this secret Glasgow mural. Hampden Park is home to Scotland national football team. In addition, it houses the Scottish Football Museum. With all the legendary players from Scotland such as Sir Kenny Dalglish, Graeme Souness and Sir Alex Ferguson you won’t be disappointed on a visit. Did you know Hampden Park was once the largest football stadium in the world? Lastly, read about the Hampden Park Stadium Tour on my travel blog. If you visit a pub in Scotland it’s highly likely they’ll be serving Tennent’s. As a matter of fact the Tennent’s brewery is located in East Glasgow and it’s open to visitors. They run several tours per day which will take you around the brewery and explain the whole process of creating this delicious beverage. Of course, at the end of that tour, you’ll be invited to try a pint! 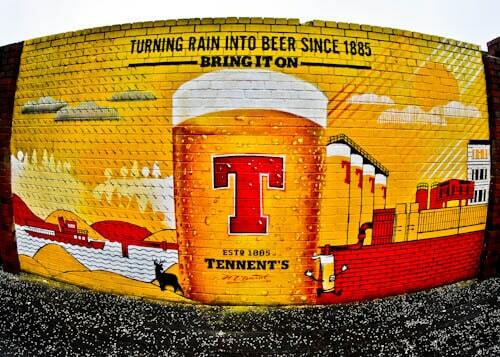 Furthermore, there are some excellent Tennent’s murals surrounding the brewery which make a nice addition to the Glasgow mural trail. 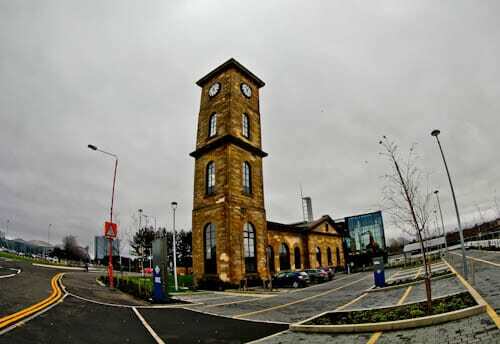 Scotland is famous for whisky therefore I recommend you sample some at Clydesdale Distillery. There are various tours available where you can learn all about the distilling process. More importantly, you can enjoy a whisky tasting session. I know Doctor Who has a cult following therefore I have included a Doctor Who Tardis on the list of Glasgow landmarks. 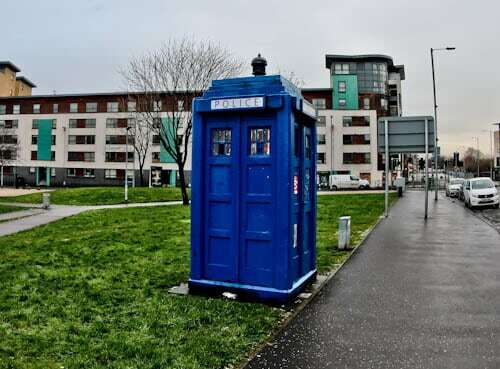 There is more than one Doctor Who Tardis in Glasgow so keep your eyes peeled. Here is the exact location of the one I photographed. If you choose a hotel such as Ibis Styles Centre West which has a central location, you can walk to each of the Glasgow Landmarks. Furthermore, Glasgow is a large city therefore you’ll come across many additional landmarks. For this reason, I recommend the official People Make Glasgow website for more travel inspiration. Check out the Istanbul landmarks, Venice landmarks and London landmarks.